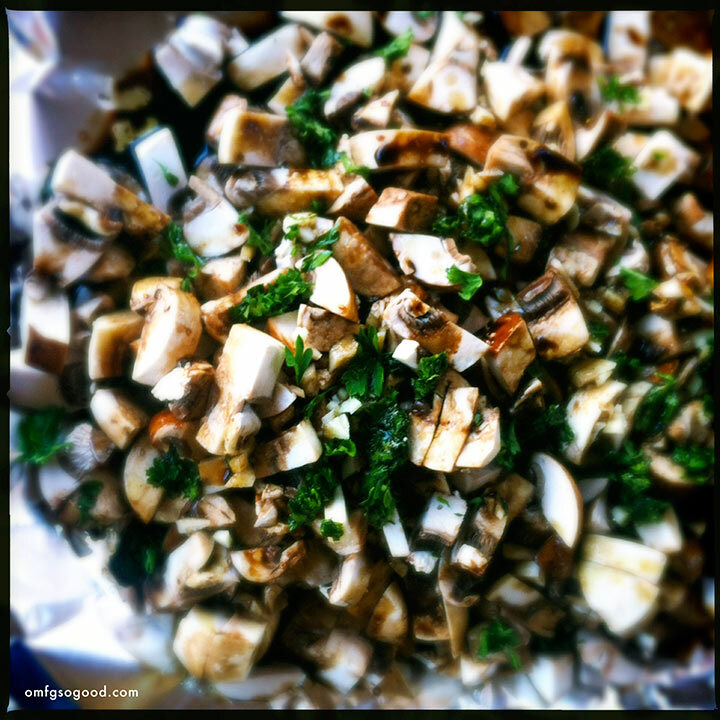 roasted mushroom salad with warm goat cheese | omfg. so good. A few weeks ago, I mentioned on The Facebook how much I adore mushrooms. One of my BFFs concurred with my statement of adoration, then challenged me to whip up a warm mushroom salad because she was missing the one from The Tuck Shop so very much. I don’t often back down from a food mission, especially when it’s from someone as rad as this lady. I could ramble on and on about the stupidly funny things we’ve done over the years, but you’d laugh so hard you might pee in your pants. And then I’d feel bad because you’d be making mushroom salad wearing cold, wet knickers. And quite honestly, if I divulge my secret fun life on the world wide web it could ruin my chances of ever becoming a powerful world leader. 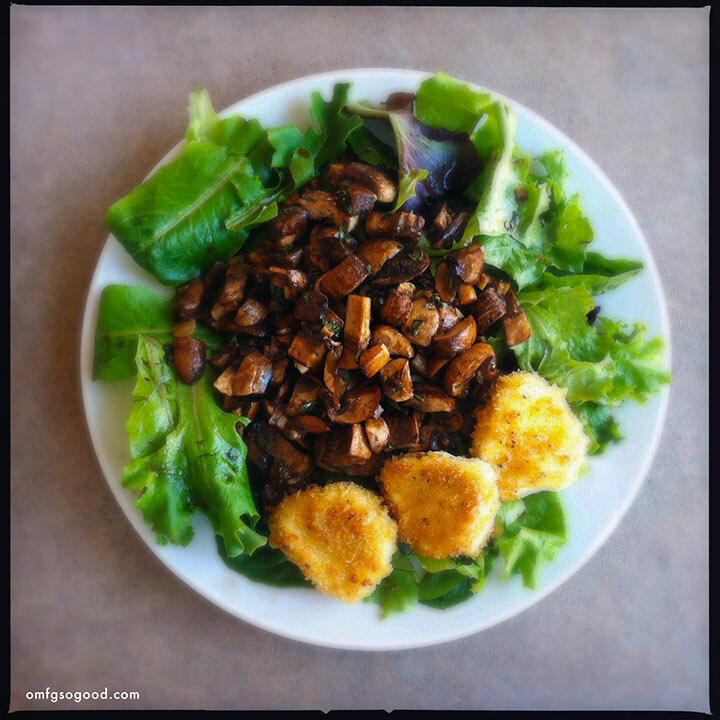 To make the mushroom salad, preheat the oven to 350 degrees and arrange a large sheet of foil on a sheet pan. Clean and roughly chop the mushrooms, transfer to a mixing bowl and add the balsamic vinegar, 3 tbsp of the olive oil, salt and pepper, garlic and parsley, and toss to combine. Transfer the mushroom mixture to the foil, and fold up the sides to create a loose package. Roast the mushrooms in the preheated oven for 15 – 20 minutes, or until they’re fork tender. 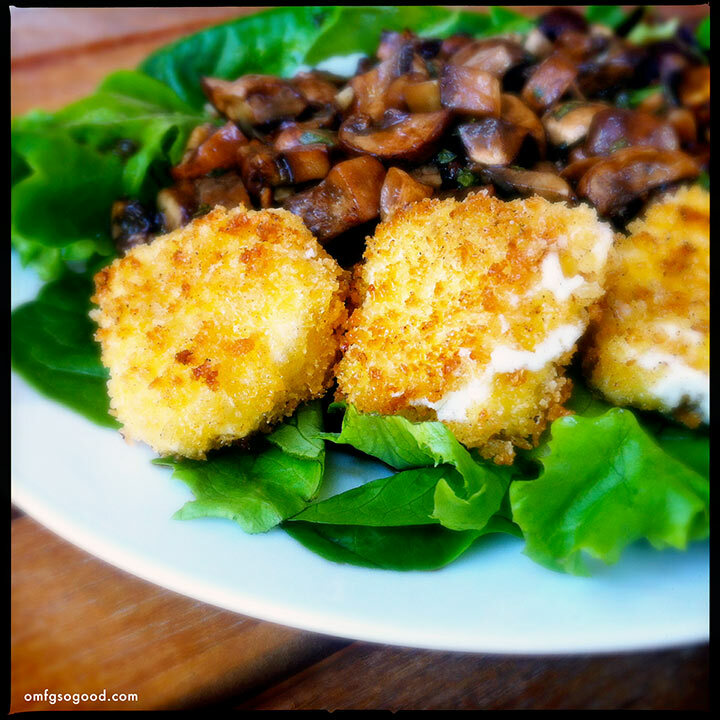 While the mushrooms are roasting, make the fried goat cheese. Cut the log (tee-hee) into 12 individual slices. Pour the bread crumbs on to a small plate and whisk the egg in a separate small dish. Dredge the sliced cheese in the egg, then transfer to the bread crumbs, evenly coating both sides and gently pressing the crumbs into the cheese. Chill the coated cheese slices in the freezer for 5 minutes before frying. In a large saute pan, heat the butter and 3 tbsp olive oil over medium heat. When your pan is hot, add the coated cheese slices (a few at a time) and cook on each side just until the bread crumbs turn a nice golden brown. If you cook them too long, the cheese will get too soft and start to ooze out the sides. Oozing is never good. Use a spatula to transfer the fried cheese to a wire rack over a paper towel, and sprinkle with a bit of salt. To finish off the salad, put your baby greens in a large mixing bowl, drizzle with the remaining olive oil and season with a sprinkle of salt and pepper, then toss to evenly coat. Arrange a bed of greens on each plate, then spoon a generous portion of the warm roasted mushrooms on top, and drizzle a few spoonfuls of the marinade from the bottom of the foil over the top of the greens.